Rising above political inclinations, representatives of different political parties today announced to jointly fight the stray cattle menace and pressurise the Chandigarh Administration to find a long-lasting solution. They unanimously demanded that a piece of land, around 25 acres, should be earmarked on the outskirts of the city for a gaushala. 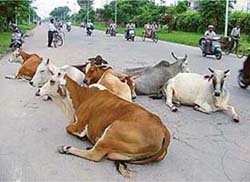 A group of stray cattle sit in the middle of a road in Chandigarh oblivious of the danger they pose to the passing vehicles. Birth certificate of still-born child! When the nurses at the maternity ward of the General Hospital today handed over the birth certificate of a still-born child to the unfortunate mother, Ms Kamaljeet, she almost suspected her husband of having sold the child after telling her that he was born dead. Mystery shrouds the death of 27-year-old girl, Heena, whose body was brought here by the Chandigarh police from Sector 21, Panchkula, this morning. The body was left by two city residents, who had earlier taken her to a Panchkula hospital for treatment from Sector 21, Chandigarh. A dengue patient from Mohali, Jaskaran Singh, has been admitted to the General Hospital in Sector 16 here. After long years of tumultuous infancy, Indian democracy has matured into a state of youthful vibrancy. The growth of public sensibility towards clean politics is evident from the results of certain polls where the difference is just one vote. “It is a matter of concern that higher education in India is in a state of stagnation which is a big contradiction in a very dynamic world”, said Mr Surjit Singh Barnala, Governor of Andhra Pradesh and Orissa, while inaugurating a two day seminar on “Quality of higher education in India: the challenge of change” organised by Panjab University here today. The needle of suspicion in the death of Harjot Kaur, a 25-year-old married woman, turned in different directions here today. The police continued investigations even as a post-mortem was performed by a board of doctors at the Civil Hospital here. She ran away from her parent’s home to marry her beloved. But being a minor, this could not work out. Now, the 17-year-old, Ridhima, has preferred to stay at a Nari Niketan instead of going back to her parents. Her request was accepted by a local court, yesterday. Army Headquarters has ordered an investigation into the circumstances under which three persons were granted direct commission as JCOs into the Territorial Army (TA), bypassing the laid down recruitment norms, it is learnt. Army Headquarters is also reportedly looking into several other complaints about irregularities in TA recruitments. Ms Gurmel Kaur, a widow with a son suffering from epilepsy, struggles to make both ends meet because she has no other source of income and the Department of Health and Family Welfare, Punjab, has not paid her salary for the past five months. PANCHKULA: The Deputy Commissioner, Mrs Satwanti Ahlawat, on Tuesday visited various sectors and villages within the Municipal Council limits to assesss the development work in the parks and roads. The Municipal Council here today unanimously adopted a resolution demanding district status for Mohali. Employees of the Punjab Urban Planning and Development Authority (PUDA) went on a pen-down strike in protest against the behaviour of two property dealers with an Assistant Estate Officer here today. The president of the Chandigarh unit of the Shiromani Akali Dal, Mr Gurpartap Singh Riar, today said there was no alliance with the BJP in Chandigarh. He said the local unit of the SAD would fight the next general election on its own or with like-minded parties, excluding the Congress and the BJP. The Chandigarh Territorial Congress Committee (CTCC) today organised a rally in the Sector 17 Plaza to protest against corruption by ministers in the BJP-led NDA government. Addressing a gathering, Mr B.B. Behl, President of the CTCC, said the Prime Minister on his return from a foreign tour had said that action would be taken against Minister for State for Environment, Mr Dilip Singh Judeo. Slices of memories from the life of Jayaprakash Narayan, “a revolutionary saint”, were recreated at a book release function at Panjab University here today. 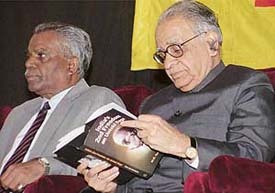 “India’s Second Freedom: An Untold Saga” is authored by M.G. Devasahayam, former Deputy Commissioner. A major overhaul of the facilities for students of Government College, Mohali, is on the cards. Other than an open air theatre, a two-storeyed Students Centre and a building for a modern sports centre, the college will house a nursery and a herbal garden. Students and staff members of Government Polytechnic Institute in Khoonimajra village near here held a gate rally today in protest against the Punjab Government’s move to privatise various polytechnic and engineering colleges. Over 100 teachers from various schools attended a workshop on the concept of e-tutoring held at DAV Public School, Sector 8, here today. A live demonstration of a virtual classroom was given to the participants by the Head of E-tutoring and Mobile Teaching from Tata Interactive System, Mumbai, Ms Sylvia D’souza. No solution to the ongoing strike in colleges seems in sight, with the students adamant on their demand for a complete rollback in the fee hike in government colleges. Sticking to their stand of not allowing the holding of classes in any of the city colleges, the students’ representatives turned away students who came to attend classes, here today. 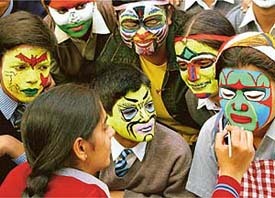 Cheerful hues mingled harmoniously to form designs on the canvas of skin as young innocents coloured their visages during the face-painting contest held this morning at the Central State Library in Sector 17. 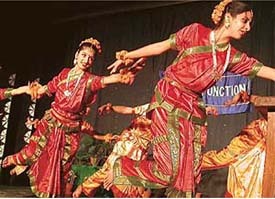 Based on the theme “Unity in Diversity and Dances of India”, the annual function of Government Polytechnic for Women, Sector 10, was celebrated with enthusiasm at the college auditorium, here today. A puja dance in progress at a cultural programme presented by students of Government Polytechnic for Women, Sector 10, Chandigarh, on Tuesday. The hearing of a bail application moved by the suspended Registrar of the Punjab and Haryana High Court, Tara Chand, was adjourned for tomorrow by a local court. The case was came up hearing in the court of the UT Special Judge, Mr R.S. 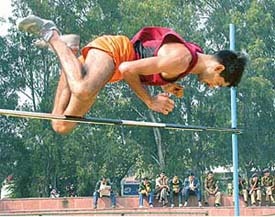 Baswana. Acting on a petition filed by the Director of Post-Graduate Institute of Medical Education and Research (PGIMER) Prof S.K. Sharma, challenging the move to send him on forced leave in October, a division Bench of the Punjab and Haryana High Court today issued a notice of motion. A case filed against the former UT Adviser, Mr Virender Singh, for setting aside his order of granting the extension of a lease of a chemist shop in the GMCH, Sector 32, in favour of Kumar Brothers Chemists, was today adjourned by a local court for filing of a reply till November 20. MOUNTED on the walls of Art Folio in Sector 9 are paintings that underline artist’s own evolution through happenings and experiences. Putting thoughts together, city-based painter Pammy Mann has structured a personal show that speaks volumes about her own perceptions about society, its degrading morals, the youth and its undermined ambitions. AFTER Delhi, Chandigarh is fast becoming a favourite destination for exhibitors to showcase their products. The most sought-after platform for the exhibitors, including multinationals, are the consumer trade fairs, often held at the Sector 17 Parade Ground. READING might be passe with computers reigning supreme, but books continue to occupy centre-stage in DAV Public School, Sector 8. It is a tradition that the school authorities are striving to keep alive by adopting innovative and interesting reading techniques in the school to ensure that the children are not weaned away from the very soul of education. Apart from routine classroom reading sessions, the school organises an activity called “Reading together for the year 200X” every year in its library stocked with over 25,000 books. I regret nothing — I remember reading the quote in a book when I was still in school. At that time, I was too young to interpret the meaning, so I asked a teacher. He hesitated before telling me that no matter what, you should always remain contented in life. A 21-year resident of Shahkot in Jalandhar district, Rohit Kumar, who won a Ford Ikon car yesterday in a prize scheme floated by Airtel, says he plans to retain the luxury car despite his rather limited resources. The Punjab Health and Family Welfare Minister, Mr R.C. Dogra, today inaugurated a state core trainers/master trainers workshop on Schools AIDS Education programme at Kisan Bhavan here. The minister pointed out that of the 1 billion population of India, every year 5,00,000 youths below the age of 25 years were getting the HIV virus. The 49th National School Games in the disciplines of lawn tennis under-14, 17 (boys and girls) and badminton under-14, 17, 19 (boys and girls) will be held from December 11 to 16 at Surat, Gujarat. The teams of St Joseph’s Senior Secondary School, Sector 44, and Government Model Senior Secondary School, Sector 10, who were declared joint winners of the UT inter-school fencing tournament. Kirandeep Kaur, a student of MCM DAV College for Women, Sector 36 has recently won a silver medal in the All-India Inter-University Cycling Championship held at Patiala. Earlier, she took part in the First Asian River Rafting Championship held at Shivpuri in Uttaranchal. She had won a haul of medals as a student of Government Model Senior Secondary School, Sector 46, in swimming and cycling categories. Krishan Chand of Liaison and Communication Sector bagged the first position in the 42-km marathon organised on the second day of the Indo-Tibetan Border Police Force’s 23rd inter-sector athletics, meet being held here. H.K. Chandra, also of Liaison and Communication Sector, came in second, followed by Jagdish Chandra of Gharwal Sector. On the second day of the 8th CBSE National Hockey Championship, Ganga International, Delhi, beat JKG, Ghaziabad 3-1 in the under-19 (boys) category, at the Panjab University ground here today. Mayo College beat Bhartiya Vidya Bhavan, 5-0 in the under-14 (boys) category. Two city-based sportsmen, Satyawan and Sunil Kumar, have won laurels by taking part in the first Asian International Tchoukball Championship, which concluded last evening at Nasik (Maharashtra). 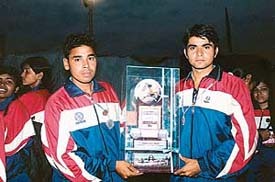 Satyawan (left) and Sunil Kumar, with the trophy they won at the first Asian Tchoukball Championship in Nasik, Maharashtra. Chandigarh is all set to host draughts events here from tomorrow. The fourth Asian Draughts Championship, involving teams from Uzbekistan, Mongolia, Nepal, Bangladesh, Kazakhastan and India, will vie for top honours in this five-day tournament. Mr Rajiv Bali, Managing Director, Mount Shivalik Breweries, has consented to become the chief patron of the Chandigarh Rowing Association. In a significant move, the Punjab State Electricity Board (PSEB) today started distributing domestic power connections to those houses which were situated outside the lal dora of Naya Goan village and were constructed after December 1998. The Punjab Urban Planning and Development Authority (PUDA) had banned connections to these houses. About 8 acres will be acquired by the Chandigarh Administration in Kaimbwalla, north of the Sukhna Lake. A formal notification under Section 4 of the Land Acquisition Act, 1894, was issued today. In a decision which will have an impact on several small businesses being run from villages falling within municipal limits of the city, the Chandigarh Administration today ordered that a wall should be built at all such places where the shops face roads separating sectors. Interestingly, at only three places in the city do shops open on main roads.